Reclaimed barn lumber, fabricated steel, and manilla rope. 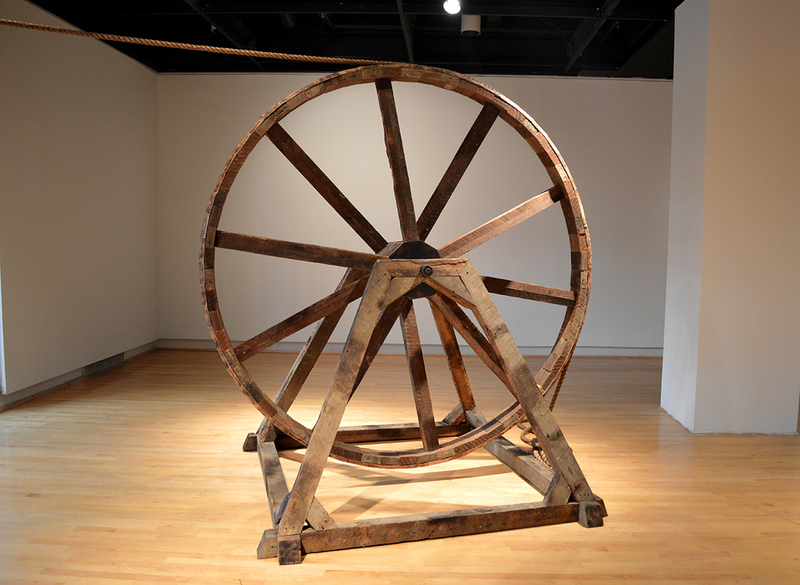 9' x 8' x 6' (upright wheel) 2' x 9' x 9' (flat wheel). Gnomon is one of four sculptures from my 2016 MFA thesis exhibition titled 'Rural Decay Almanac' at the University of Maryland College Park Art Gallery. The following is an excerpt from my written thesis. A Gnomon is the vertical part of a sundial that casts a shadow. These naturally occur as a time-telling device. Anything that casts a shadow uses its own physical mass in relation to the arch and orbit of the earth around the sun, 93 million miles away. Similarly, the two objects comprising the sculpture are dependent on one another, in terms of anchoring weight and balance. The suspended form in the atrium acts as a lure to the rest of the exhibition.